DAVID Rodan was in primary school when his dad would drive him all over Melbourne's northern suburbs looking for a rugby field. The Rodans were only a few years into their new life in Australia, having moved to Australia from Fiji in 1987, when David was about four. "Dad couldn't find any rugby clubs so I gravitated to footy," said Rodan, now 33 and fresh from his debut as the first AFL player to make the transition to goal umpiring at the highest level. Rodan started playing footy with the Holy Child club, a now-defunct club linked to the still-thriving primary school of the same name in what is now Dallas, a suburb in Melbourne's north with a rich multicultural population (almost 50 per cent are Muslim). He quickly took to his new environment (learning English and acclimatising to a new culture) and to the game, finding the environment fun and friendly, notwithstanding his perceived shortcomings. "I was short and from a different background," he said with a laugh. "But it probably helped that I was an 'okay' player." Although he had strong relationship with his father, David snr, he found they couldn't talk footy in his early playing days, as his dad was still learning the game himself. Rodan would become a star at junior level; he was quick and skilful, and he developed confidence by engaging with teammates and seeking feedback from his junior coaches. Longtime TAC Cup coach Robert Hyde, who was quick to note Rodan's potential when he was selected for the Calder Cannons squad, would become one of Rodan's most influential mentors. "Robert was brilliant for me. He gave me validation. In many ways, he was ahead of his time as a coach. He knew how to identify a player's strengths and how to get the best out of them," Rodan said. Rodan would win back-to-back Morrish medals (2000-01) as the best player in the TAC Cup competition. While Rodan was making a name for himself, his family were also being drawn to the game, his dad volunteering as a goal umpire, his mum Amelia helping in the canteen and his siblings Betty, Caroline, Gordon and Helen (who played for Collingwood's AFLW team this year) working the scoreboard. As the family grew to love the game and its culture, they in turn started to play an increasingly important role in introducing football to Melbourne's Fijian community. "Football helped us connect to Australian society. It's played a very large part in our lives," he said. Rodan played 185 games for Richmond, Port Adelaide and Melbourne, mainly as a small forward or midfielder. He loved playing with flair and knew how to kick a spectacular goal. His resilience to continually come back after multiple serious knee injuries earned him widespread respect. He was one of the first AFL players to have the radical LARS knee reconstruction surgery, where surgeons use synthetic fibres to replace a torn ligament. Rodan twice had the procedure done, making a swift return to football each time. "In many ways, having those injuries was the best thing for me," Rodan said. "They made me train harder and taught me so much about the importance of looking after my body and training my mind." Soon after he retired in 2013, Rodan took up a multicultural engagement role with AFL Victoria while also beginning the next phase of his on-field footy life as a goal umpire. He found a new mentor, former AFL goal umpire Jason Venkataya. "Jason has been a great technical coach for me and has become a genuine role model. It’s been so helpful being able to learn from him," Rodan said. Rodan started goal umpiring at under-18s level in local footy, progressing through to seniors before moving to the TAC Cup and later the VFL. "I didn’t want a token role and I wanted to have as much development as I could get," he said. He umpired his first AFL match in round 16 (North Melbourne-Fremantle at Etihad Stadium) and on Saturday, will be waving the flags during the Carlton-Geelong game, also at Etihad Stadium. "It's harder than a lot of people think," he said. "A lot of it is about positioning and watching the ball flight." 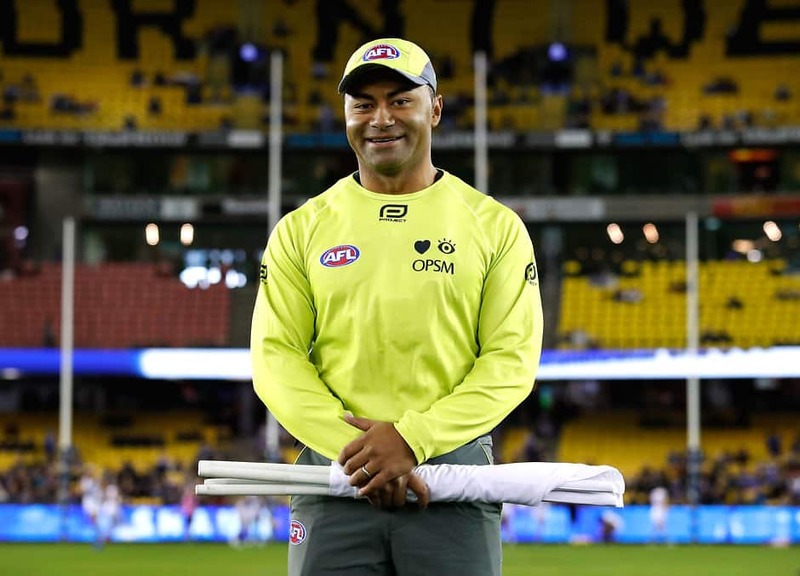 Rodan, who has four boys with his wife Carla (Tevita, Maikeli, Tomasi and Salesi) recently initiated a pilot project as part of his role at AFL Victoria, aiming to recruit youngsters from multicultural and indigenous backgrounds to goal umpiring. He hopes to take the program nationally. "I'm trying to show people that footy provides a lot more opportunities than what it appears to," he said. "There's a role for everyone, with so many opportunities in different fields."